One of my favourite workspaces to date, even though I couldn't sit on that chair for more than two minutes. 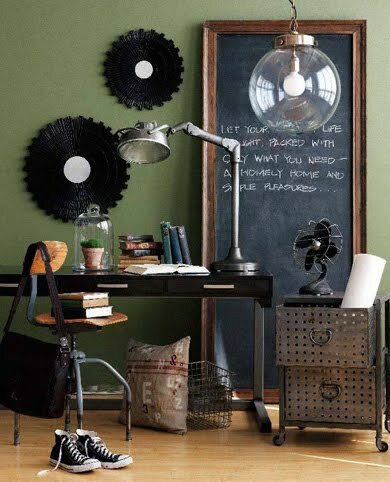 I love the green, the industrial wire chic and the huge blackboard. Is there anyone in the world who doesn't love a blackboard? Margot Austin, via Fleur Avenue. The blackboard is great, but I'm really in love with that little metal filing cabinet. Sweet! Love the industrial look - we have lots of flea market finds like this, so much more interesting than furniture bought from a shop. I need that incredible chalkboard to keep me organized!!! I love the workspace and the metal cabinet.. it completes the whole industrial look. The retro/industrial look I love a lot. That rolling cabinet and the huge desk lamp that looks like it shoud be in an old dentist office. OMG i L.O.V.E. that chalk board!! so many things to love, the lamp is my favourite! so simple, but such a statement piece. i'm about to paint a door leading from our kitchen into the den with chalkboard paint.... not the same as this great piece, but fun concept! This workspace juts oozes casual cool! That's a beautiful workspace. The green is amazing and the slightly over sized lamp too. The only thing I am not crazy about is the wall decorations - those frilly lp:s is not my cup I guess. great look! I love everything in it. My dear, it's been so long since I've been by and I am just floored and so thrilled to see your stunning success. Huge congratulations from all the way across the pond!